CEOs and HR heads now need to watch out if their employees are being driven too hard. And take corrective action soon. On the road: Most of your top guys are on the road. But being on the road means less sleep, erratic food and stomach flora disrupted due to foods from different regions and time zones. Translated into health terms, lack of sleep puts the heart at risk and lowers immunity; erratic eating and flora disruption means indigestion lower immunity and higher risk of allergies. Solution: Try stipulating a roster, where periods of sedentary rest or office work are mandatory. Also, get a nutritionist on board to consult with your top people and recommend probiotics and healing foods for repair and rejuvenation. Emails: You get emails at odd hours. This doesn't mean that the employee is working dedicatedly, but that there is stress. A lot of employees get stressed about work, and this comes out when they are outside the office, at home, and are unable to switch off. Many may take the refuge of work to escape from home stressors. Solution: A stress-free employee is more productive. Sign up for an employee assistance programme for your company, where counsellors are available 24x7 and this becomes the stress helpline for your employees. Fat employees: Many of your key folks are obese. An overweight employee is at risk of lifestyle diseases. In urban corporate India, this is a problem executives live with. And the lighter they are, the more agile they will be in their minds and bodies-which translate to higher productivity. Solution: Re-look at your café menu. Run nutrition campaigns at work. These are low cost, outsourced to health companies, and garner quick results. Put nutritive labels on café foods. Run a weight loss contest and see their competitive side come out, as well as reap the rewards of fitter folks. Attention span: There are attention span issues. You just said something and you forgot your train of thought. You asked the person you were talking to. And he/ she looks blank. An overloaded brain sometimes just refuses to absorb. Which means you and your team could be missing vital information that could mar the delivery of projects. Solution: Institute a time-out zone. It's important for people to switch off for a bit. TV, carrom or an in-office gym are some of the time-out zone activities that help. This relaxes employees and makes them sharper. Substance abuse: Suddenly, substance abuse rates are high. You enter the office and the corridor is full of smoke. The number of smoking breaks keeps creeping up. The late evening binges become an everyday affair and you hear random conversations around where to go today at 5 pm. In corporate India, the average age of employee is 27 to 29 years. They feel stressed, and also feel that there is a lifetime ahead to slow down. Hence they work hard and party hard, not realising that high cholesterol and hypertension start at this age due to substance abuse and erratic eating. Solution: Institute a smoking cessation programme and link it to tangible rewards. 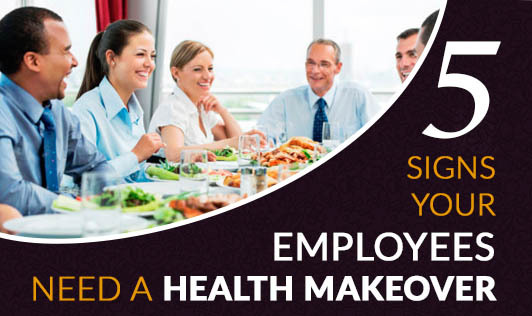 Begin a company health website that starts making the younger population aware of such issues. No amount of talking or workshops will do the trick as much as an online health forum for them. Get health experts to chat with them. This will make the younger lot aware, and a ‘cut smoking' contest can actually get some to quit.